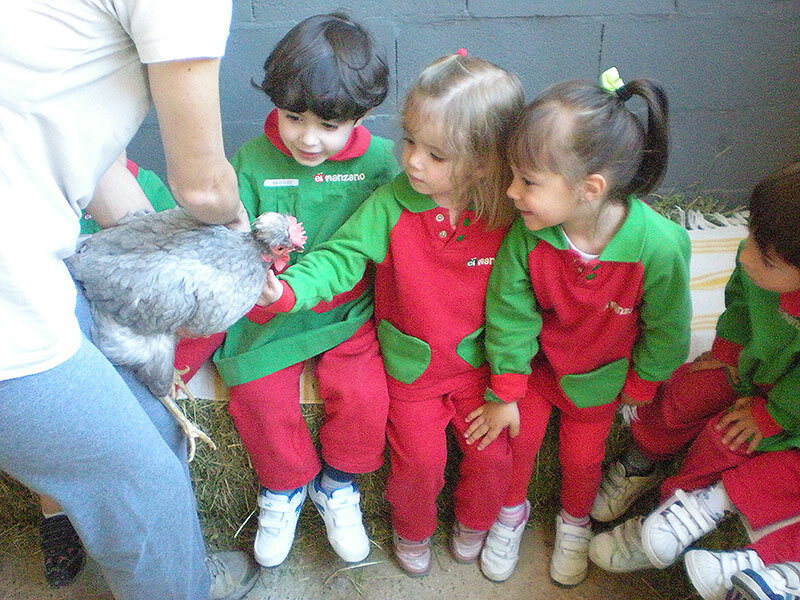 The Bilingual Plan of English P-2 (2-3 años) “Robin Bird” (Blue), is integrated in the classroom and is worked globally in all of the activities. This area of knowledge and experience refers to the gradual construction of their own identity and their own emotional maturity and to establishing affective relationships with others and to their personal autonomy as inseparable and necessarily complementary processes. The contents of this area acquire meaning from the interrelation with the rest of the areas which will be interpreted in the didactics proposal from global action and learning. 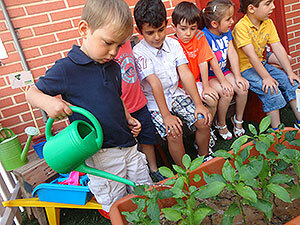 In this personal building process the interaction of the pupils with their environment, their growing motor control, emotional awareness development, verification of their possibilities and “limits”, the differentiation to others and their growing independence from adult people are very relevant. 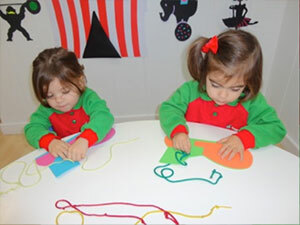 This area of knowledge and experience hopes to develop children’s communicative abilities by learning to use, more and more adequately, different ways of body, gestural, verbal, -oral and written-, artistic –art and music-, audiovisual and technological communication and representation, helping them in this way to improve their knowledge and relationships within their surroundings. These ways of communication and representation serve as a nexus between the exterior and interior world as they are symbolic instruments which make a representation of reality, expressing thoughts, feelings, experiences, regulating behavior and interactions with others possible. Show concern for social problems inasmuch as representing current problems which our societies are living and connecting them to information, concerns and experiences of the pupils. Connecting the school to everyday realities. School education must promote a crossing between public culture and everyday life of pupils. Moreover, in education a comprehensive development of intellectual, affective, social and moral abilities must be achieved. Emphasize the values of education as an axis which are essential to a comprehensive education. Allow adopting a social perspective critique when facing traditional curriculum which complicates global views of interrelated problems of humanity. 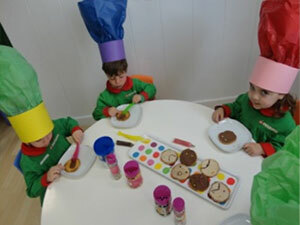 Each area has its own objectives and a series of activities with specific content are carried out during this period. 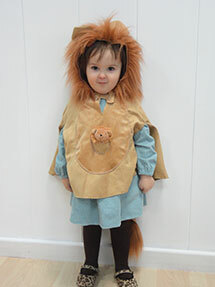 Their purpose is to support the construction and learning process of children. We would like to learn from nature. It is better than a science class as it is not theory, it is learning whilst in contact with reality, touching the soil with your hands, smelling, observing… something which is essential for children’s learning. Their imagination is roused as it is a very dynamic process. Each situation that occurs gives way to a question, a new experience. We plant in season vegetables throughout the school year, watering them and taking care of their growing and ripening process. An intelligence bit is a bit of information. Its fulfillment is found in using and illustration or a precise picture or good quality photo, which presents a series of very important features: It must be precise, exact, clear, big and original. The intelligence Bits are very useful to stimulate the brain, learning and the memory of the child, especially between the ages of 0 to 3, as this stage is crucial for the development of the child. Music contributes to fomenting social, intellectual and emotional development, and helps to develop physical aptitude, handling personal feelings, develops enjoyment of children’s cultural traditions and creates opportunities for them to express themselves. If we include music as part of their education, children will enjoy happy moments in which they are able to show communication, movements, socialization and creativity; moreover it gives them the opportunity to nurture learning by stimulating their development and strengthening their aptitudes to establish strong and healthy relationships with other people. The programme is divided into terms and is composed of the following contents: Instruments (musical, body, classroom material and kitchen), auditions, music of the world, environment sounds, games, dancing, songs and graphical symbols. The TIC (Communication and Information Technologies), offer a constructive activity to children, strengthening and stimulating their initiative and creativity promoting meaningful learning. 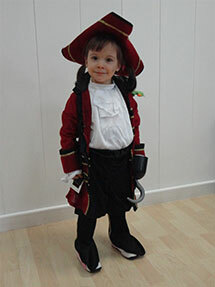 We carry out interactive games; work on writing abilities, shadow theatres, etc. 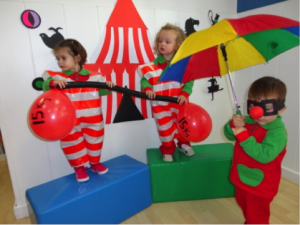 Through directed games children learn to strengthen and develop their expression abilities, both interpretative and creative, using teamwork dynamics and development of their imagination. It is a creative space and an approach to artistic expression. Our aim is to increase the experience framework of the child, to help them get to know and to relate to their equals, fomenting teamwork and co-operation and develop their imagination and creativity. The whole process is carried out using techniques of creating stories and improvising. 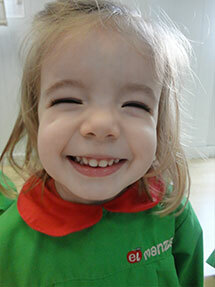 It is about offering the child different expression techniques and resources to improve their expression-communication abilities. In short, to support the formation of creative, free, stable beings. Cookery workshops for children are a wonderful way to interest children and even more to create enthusiasm for healthy food. Children have the opportunity to create healthy meals which teach them while they learn important abilities on autonomy and creativity. They also learn about safety in food and about the ability to plan a meal. 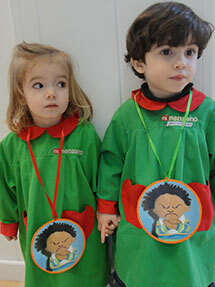 We help them to learn about good habits in nutrition and the healthy options in a fun, interactive way.